Bake a sheet cake the size that you need. Ice the sheet cake with white or ivory colored icing, making sure that it is nice and smooth. Let the icing set for about an hour. You can use the parchment paper transfer method to put the figure of Ben on the cake top or draw it on with an icing filled bag and round tip #5. Using Color Mist food color spray green and yellow, spray the top of the cake with green and yellow streaks radiating from the center of the cake. This is your background. Let this dry completely. You will be using the round tip #5 to do all the outline work and the star tip #16 to do all the fill in work. 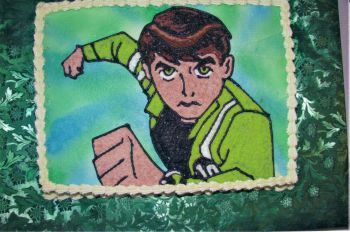 Use a black icing and outline the entire Ben-Ten. To fill in his hair use black, brown, and light brown icing. Next fill in the eyebrows with black icing . The mouth is also done in black icing The eyes are done in white, yellow green, and black outlines. Make a flesh colored icing and fill in the face, neck and the hands. Fill in his shirt and the circle on his jacket with black icing. Next fill in the white stripes an his jacket. Use the yellow green icing and fill in the rest of his jacket. Use the ivory icing and tip # 18 and make a shell border around the top and bottom edge of the sides of the cake.